It is with great sadness that the Kunstler Fund announces the passing of our friend and fellow anti Rockefeller Drug Law activist. 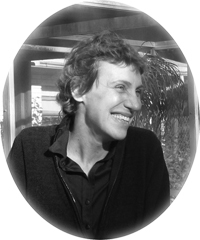 Click here to read more about Veronica, tand to view a short film make by the Kunstler Fund. A new documentary work-in-progress about William Kunstler, directed by his daughters Emily Kunstler and Sarah Kunstler. For more information about the documentary please visit the film's website. 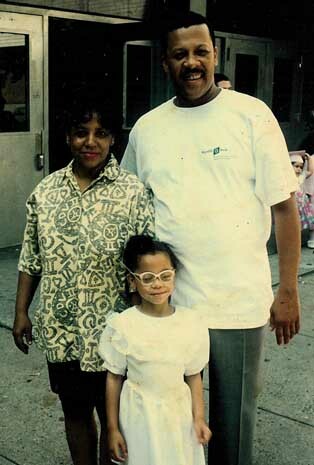 HELP US RETURN PRISONERS TO THEIR FAMILIES UNDER THE RESTRUCTURED ROCKEFELLER LAWS. THE KUNSTLER FUND IS COMMITTED TO HELP ELIGIBLE ROCKEFELLER INMATES GET RESENTENCED. Another tragic consequence of New York's Rockefeller drug laws. Leaving the Courthouse: Freddie Brookins Sr. leaves with Randy Credico with the William Kunstler Fund for Racial Justice in New York. The Kunstler Fund has been working tirelessly to make sure the media and the press has stayed focused on this unfolding story. We extend our warm support and congratulations to the families of the Tulia 46. "A former undercover narcotics agent whose testimony led to drug convictions of 38 people, nearly all of them black, in a small, predominantly white Texas Panhandle town was indicted yesterday on three felony perjury charges, a development further damaging the credibility of his investigation." By Simon Romero, NYT Read more. Will The Legacy Of Tulia Be The Death Of Bucks For Busts Policing? "Tom Coleman is merely the symptom of a much bigger disease," says Randy Credico of the William Kunstler Fund for Racial Justice, which was instrumental in bringing Tulia to the public's attention. "It's this country's out of control drug task forces that are the real cancer." Read more. The Kunstler Fund salutes Ryan Matthews and his struggle for justice. Ryan, who is mentally retarded, was 17-years-old when he was accused of murdering a grocery store owner in Louisiana. 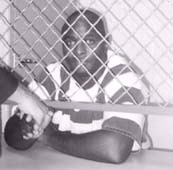 Ryan was sentenced to die in 1999, and is currently on death row at Angola Prison. His lawyers recently uncovered DNA evidence that exonerates Ryan and points to another killer. For more information, visit www.reprieve.org. The Kunstler Fund video, "Tulia, Texas: Scenes from the Drug War"
Jeff Blackburn, Mattie White, and Randy Credico on DemocracyNow! 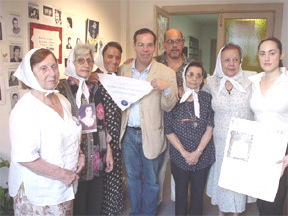 Kunstler Fund Director Randy Credico was present in the courtroom when Marion Young was sentenced to 35 years on November 15th, 2001 Caldwell, Texas. Exactly one year later his convicted was overturned and the case was dismissed due to insufficent evidence. 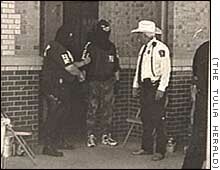 Texas' "Tulia law" passed last year requiring corroborating evidence for the testimony of undercover confidential informants to obtain a narcotics conviction, and the case was overturned on that basis. 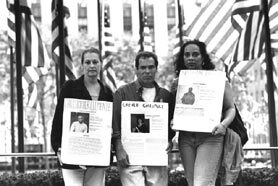 Mothers of the Disappeared honored at Union Square Awards. 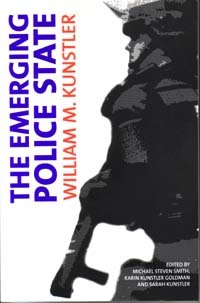 Donate $100 to The Kunstler Fund and receive a copy of THE EMERGING POLICE STATE, a book of speeches by William Kunstler on the errosion of our civil rights. READ MORE. Rockefeller Drug Law Updates Recent articles about the Rockefeller Drug Laws. For information on how to order the Kunstler Fund's 26-minute video, click here.